NSI has used human behavior analytics in support of numerous client initiatives to clarify, generalize, and explain human behavior complexity in political, economic, societal, and cultural contexts using multidisciplinary social science analytic methods. 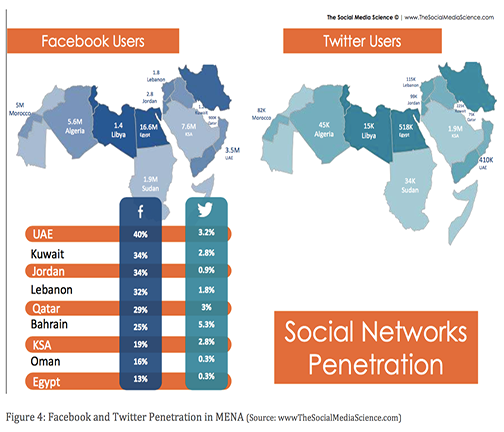 ￼NSI conducted an overview of the current literature on the intersection of social media and off-line political events. We reviewed the empirical literature and found that it suggests that it may be erroneous to think that Twitter, and social media in general, serves as a driver of political change. Rather, the preponderance of the literature suggests that it is the nexuses between social media and the socio-political-economic context that plays a pivotal role in furthering political debate and facilitating the dissemination of information. Leveraging our human behavior analytics, our review of the literature found that some consensus is emerging regarding the foundational questions that define this area. Over the past decade social scientists, from diverse fields (such as sociology, psychology, political science, and communications science) have turned their attention to improving our understanding of the role social media plays in political and social behavior. Their research provides us with a more structured, theoretical, and evidenced-based approach to understanding the role of social media. As this is a relatively new area of research, and one that crosses multiple disciplines, there is little consolidated theory or findings at this stage. We identified three overarching questions that emerged from this research. First, to what extent does social media change political behavior and events? Second, how do both opposition groups and governments use social media to influence political behavior and events? Third, how can social media data be used to predict and explain political protest behavior and events? An understanding of the applications of social media data that have shown to be reliable and predictive, and those which have not, helped us identify the areas in which such data may be most effectively bolstered and contextualized by more traditional data and qualitative analysis. NSI was the technical lead for a pilot study focused on understanding potential intended and unintended consequences of influence actions against violent extremist organizations (VEOs). Several techniques from our human behavior analytics were utilized combining social science and neurobiology expertise to inform our understanding of methods to effectively influence/deter and to assess anticipated and unanticipated effects of influence and deterrence efforts. We created quick turnaround analytical products that provided a multi-method, multidisciplinary exploration of Al-Qaeda in the Arabian Peninsula (AQAP). Our analysis enriched our understanding of how to effectively influence and deter AQAP, as well as assess anticipated and unanticipated first-, second-, and third-order effects of influence and deterrence efforts. 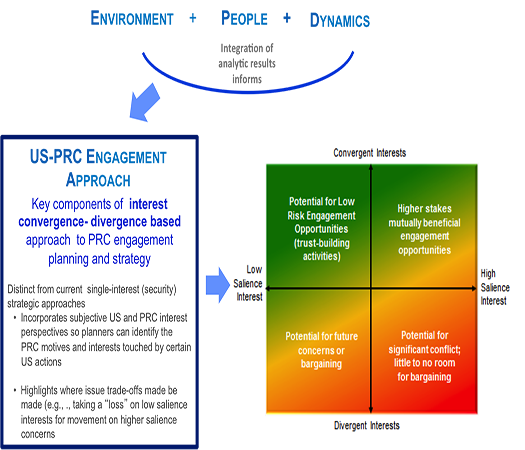 We also developed a consequence planning analytic framework to aid planners and analysts in assessing possible second and third-order consequences of counter-VEO actions, and tested the framework against Pakistan. NSI led the Pakistan and Afghanistan (PAKAF) rich contextual understanding (RCU) II effort for the International Security Assistance Force (ISAF) Commander. The project goal was to provide the ISAF Commander with a “rich contextual understanding” of forces for conflict and for peace in the PAKAF area of operation. NSI utilized numerous techniques from our human behavior analytics to plan, manage, and execute multiple social science modeling efforts conducted at the provincial level, for prioritised areas, and at the district or individual actor levels. We also conducted multidisciplinary, multi-approach analyses and reporting responses to questions posed by the CJ-2 ISAF and the ISAF Joint Command (IJC) in three critical operational areas: means of marginalizing the insurgency, ways to better engage and protect the population, and enhancing governance in Afghanistan. 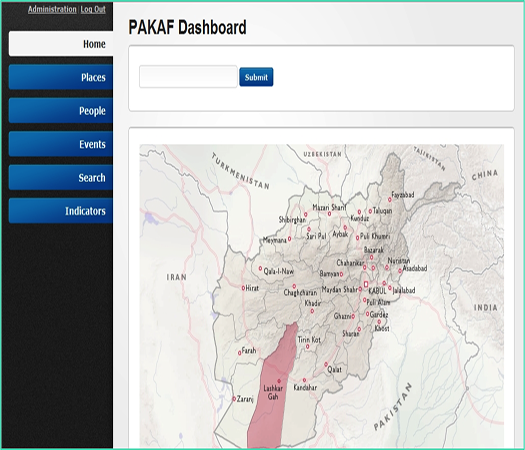 NSI also conducted a social network analysis (SNA) of Paktika province and a longitudinal analysis of Afghanistan survey data for ISAF as part of the PAKAF Rich Contextual Understanding effort. NSI also provided knowledge management services in the development, population, and maintenance of a community of interest and a knowledge sharing and collaboration platforms for the SMA effort. The community includes broad membership across DoD, interagency, industry and academia. The knowledge management platform provides a comprehensive source of research and analysis to enable commanders to develop a deeper understanding of the cultural context of the populations within which they operate. NSI led the PAKAF RCU I project which focused on providing the ISAF Commander with a RCU in the Pakistan-Afghanistan (PAKAF) area of responsibility. 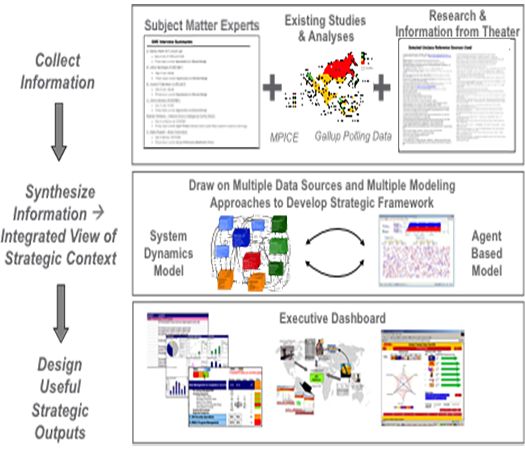 NSI’s role spaned all components, including overall program management and leadership, research, writing and production of the responses, reports, and assessments, and development support of the RCU-Vis software. We utilized several techniques from our human behavior analytics to integrate the robust expertise available in the continental US with in-theatre analytical efforts in order to produce a richer view of the Pakistan-Afghanistan strategic and operational environment. 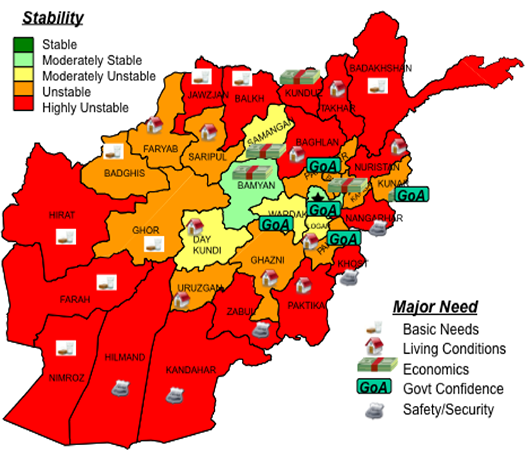 The overall PAKAF I program focused on 16 districts in three provinces in Afghanistan (Kunduz, Paktika and Helmand) and 10 districts in Pakistan. It consisted of six interrelated components: 1) development and population of classified and unclassified, annotated and searchable data libraries; 2) “all-district” data generation and multidisciplinary, multi-method assessment efforts; 3) a “deep dive” on Helmand province; 4) response to “40 Questions” directed by the ISAF G2; 5) production of “rich contextual” materials; and 6) development of an RCU-Vis software application containing easily accessible and searchable information on the 16 districts in Afghanistan and Pakistan. NSI supported a study at the request of SOCCENT to assess the appeal of ISIL. Specifically, the study focus was to answer the question, “What makes ISIL so magnetic, inspirational, and deeply resonant with a specific, but large, portion of the Islamic population allowing it to draw recruitment of foreign fighters, money and weapons, advocacy, general popularity, and finally support from other groups such as AQAP and Boko Haram?” This study attempted to understand the psychological, ideological, narrative, emotional, cultural and inspirational (“intangible”) nature of ISIL given there has been no consensus on the set factors that define the appeal of ISIL to date. NSI developed an umbrella framework (termed the Evolution & Longevity Framework) utilizing techniques from our human behavior analytics to understand the appeal of ISIL that incorporated five critical elements inherent in the evolution of a revolutionary movement into a functioning government. The five elements describe the organizational attributes and conditions (appeal) requisite for a revolutionary movement (like ISIL) to evolve into a functioning government, in this case a caliphate. 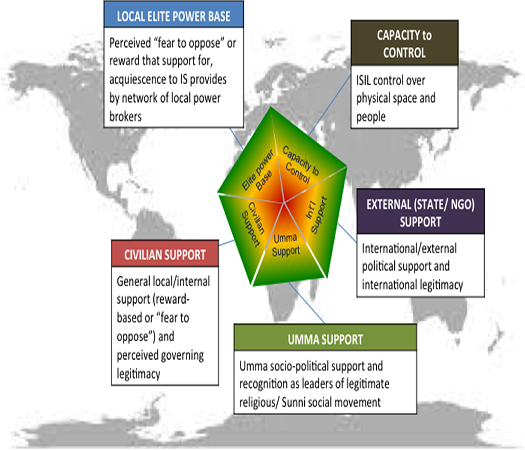 Evidence was solicited from each of the study participants along each of the five sets of criteria, each with its own set of observables: the strength and loyalty of ISIL’ local elite power base; ISIL capacity to control; external (state/NGO) support for ISIL ideology and activities; Umma support; and local civilian support. Sixteen organizations researched these hypotheses and presented their findings in accordance with the Evolution & Longevity Framework. The framework satisfied multiple objectives: to lay out the landscape or “schools of thought” regarding the intangibles that explain ISIL support and achievement; to guide the identification of the intangible factors that explain ISIL growth or decline; and to help distinguish those factors that relate to ISIL specifically (e.g., as the organization and the “brand”) from those that relate more broadly to a sustained militant radical Islamist ideology and movement. NSI conducted research, analysis, design, and development of a prototype modeling and simulation tool for projecting the dynamics of emerging ethnic conflict and the impact of military plans, policies, and actions. Utilizing techniques from our human behavior analytics, ERIS conducted basic research from leading social science literature of the dynamics of ethnic conflict, repression, and strife; mathematical design of the simulation using system dynamics and agent based models; simulation programming and software development in Java within the AnyLogic M&S platform; scenario design and implementation; empirical verification and validation of simulation results utilizing publicly available data; military utility assessment; and deployment of the simulation technology at client sites. NSI led an effort to identify, examine, and evaluate the necessary theoretical concepts and relevant analytic techniques for assessing the causes of “deterrence surprises” and the secondary effects of US government and allied efforts to deter attack from violent extremist organizations. 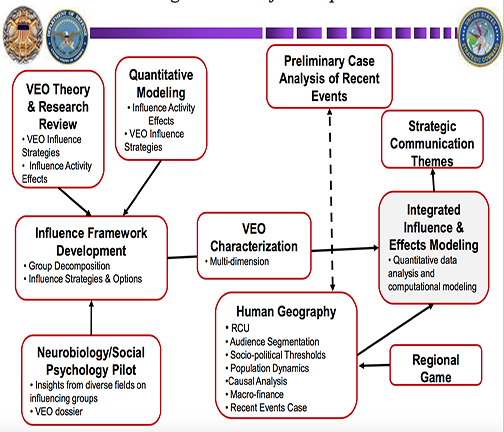 We utilized techniques from our human behavior analytics to examine the VEO literature for current theoretical understanding and quantitative and qualitative assessments of deterring VEOs and international responses to their operations. 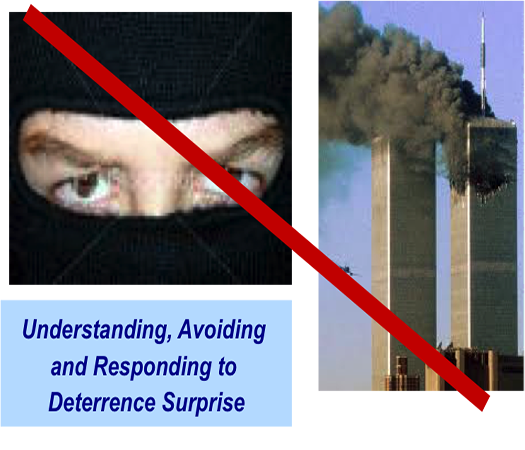 We also developed a conceptual VEO deterrence model that we trained on the 9/11 attacks to inform the construction of a conceptual VEO influence and response model that can be used to assess deterrence strategies against VEOs, adversary decision-making, and secondary effects and unintended consequences of various response actions. We tested the conceptual VEO deterrence model against additional exercise scenarios and roundtable workshops to derive strategic planning considerations including a VEO deterrence-decision model. As part of this effort, NSI also participated in the “Cyber on the Brain: The effects of CyberNeurobiology and CyberPsychology on Political Extremism” effort where we edited and contributed to a series of white papers focused on understanding research from the fields of CyberNeuroscience and CyberPsychology on political extremism, with a particular focus on exploring the nexus of the cyber realm and the physical realm. NSI examined future political, security, societal and economic trends utilizing techniques from our human behavior analytics to determine where US interests were congruent or in conflict with Russian interests and possible leverage points when dealing with Russia in a global context. Of particular interest were Russian perceptions of US activities in Eastern Europe and what impact those activities have on deterring Russian aggression in the region. We also considered where NATO interests were congruent or in conflict with Russian interests. 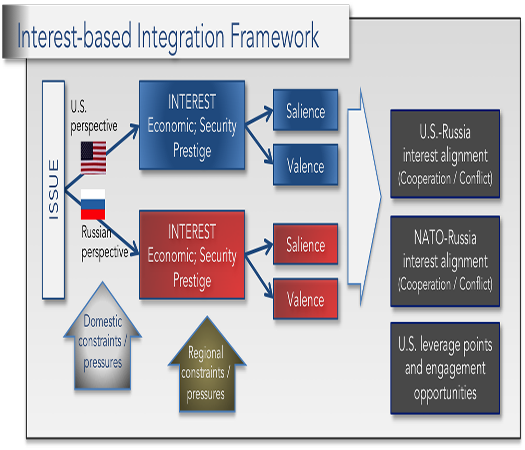 NSI developed an interest-based integration framework to identify and evaluate interests from both the perspective of US/NATO and Russia, the relative salience and valence from each issues/actor perspective, and areas of risk and opportunity. Also, we identified areas of strategic risk and opportunity in the EUCOM AOR over the next 15 years, components of an effective US/Russia engagement strategy, and where and how EUCOM can best direct its resources to further US interests. NSI led a multi-modeling effort for US Central Command (CENTCOM) focused on a strategic assessment of the Sudan and Horn of Africa (HoA). The objective was to supplement CENTCOM’s strategic assessment of the Sudan and HoA with an evidence- and multi-model based analysis by applying quantitative and computational social science models that addressed three concerns: (i) root causes of the humanitarian crisis, (ii) regional effects Sudan is having on the Horn of Africa, and (iii) conditions that are causing Sudan to become a safe haven for nefarious activity. 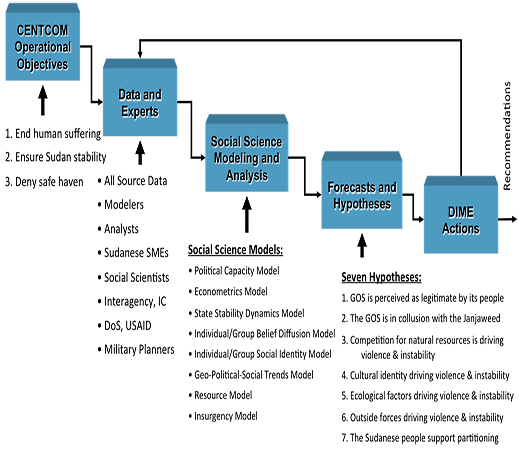 We utilized techniques from our human behavior analytics to assess the merits of various quantitative and computational social science model approaches, along with developed tactics, techniques, and procedures that addressed how to rigorously integrate and leverage subject matter expert (SME) inputs with social science models. NSI participated in a large effort focused on identifying areas of strategic risk and opportunity in the Asia-Pacific region over the next two decades. NSI utilized techniques from our human behavior analytics to examine future political, security, societal, and economic trends; identify where US strategic interests are in cooperation or conflict with Chinese and other interests worldwide, and in particular, to the East China Sea; and assess drivers of divergence, conflict, and convergence when dealing with China in a global context. NSI developed the US-PRC Global Engagement Framework based on the inputs and variety of analytic results produced by other team members to facilitate consistent and coherent integration. 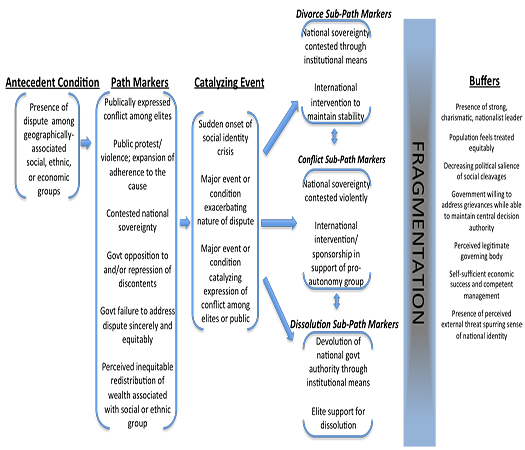 Some “key parameters” of the US-PRC Global Engagement Framework included US-China economic trade barriers, imbalances, opportunities, environmental concerns, food security, agricultural policies, water management, carbon-based fuel alternatives, scarcity of resources (competition and cooperation), freedom / denial of access and intrusion issues, military challenges and opportunities, technology and academic exchanges, human rights, national demographics and their impacts on economies, human migration, and third world development. NSI also helped bridge strategic level analysis and operational level needs to ensure the concepts, analyses and results were actionable for end-users such as military planners, strategists and/or decision-makers. NSI conducted a “fragmentation” analysis with the focus being to answer the question what path is Pakistan on. This is an extremely difficult question to answer and leads to an answer that is too static to be reasonable or too long. This is because at any point in time we might observe in a state such as Pakistan, evidence consistent with any number of future pathways. For this reason our approach was to look at where the balance of the evidence lies – which might be the dominant path – and more crucially, which are the indications and warnings that we should be looking out for in order to understand day-to-day in Pakistan in terms of what they say about movement along one path or the other. Our basic approach was to utilize techniques from our human behavior analytics to first start with theoretical propositions about the nature of the pathways, we then tested these against historical cases used to refine our path characterizations, and finally we applied the refined paths to look at Pakistan from today forward. The general pathway descriptions we have constructed are not just applicable to Pakistan but could as easily applied to assess for example, where Turkey is relative to fragmentation, or whether Afghanistan is moving forward or slipping backward in terms of political, economic and social development.